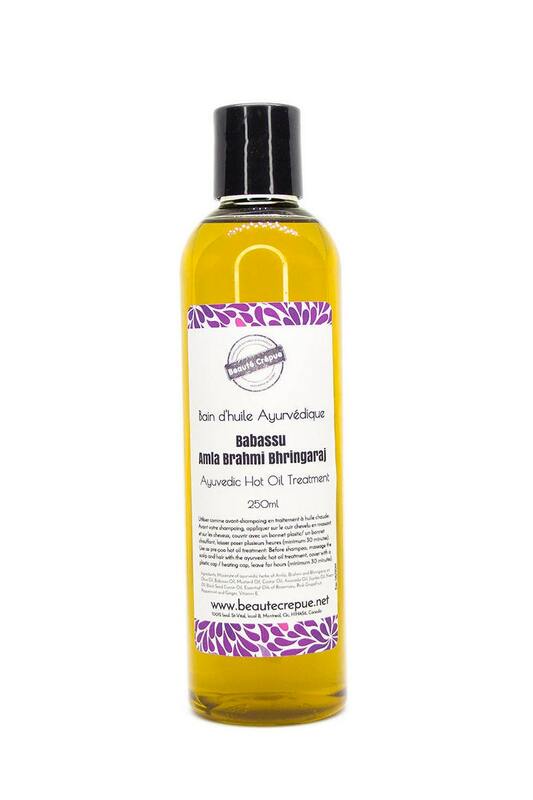 Perfect blend of natural oils, ayurvedic herbs and essential oils for your hot oil treatment. It provides immediate beauty and shine to your hair and most importantly, it strengthens your hair. Revitalized, nourished and strengthened, your hair is softer, stronger and thicker. This hot oil treatment is also beneficial to your scalp: the scalp is toned and strengthened. Use as pre-poo hot oil treatment: Before your shampoo, apply on the scalp massage and hair, cover with a plastic cap / heating cap, leave for several hours (minimum 30 minutes). - Brahmi: Tonic, it promotes hair growth, while the thickening and making them shiny. It soothes the scalp and helps fight against dandruff. - Bhringaraj: Bhringaraj is the "plant of the hair" in Ayurveda and helps fight against hair loss, baldness and premature gray hair. It helps to keep hair very black and dense. - Babassu oil: Protective, it prevents dehydration of the hair. This oil restores radiance and strength to damaged hair. 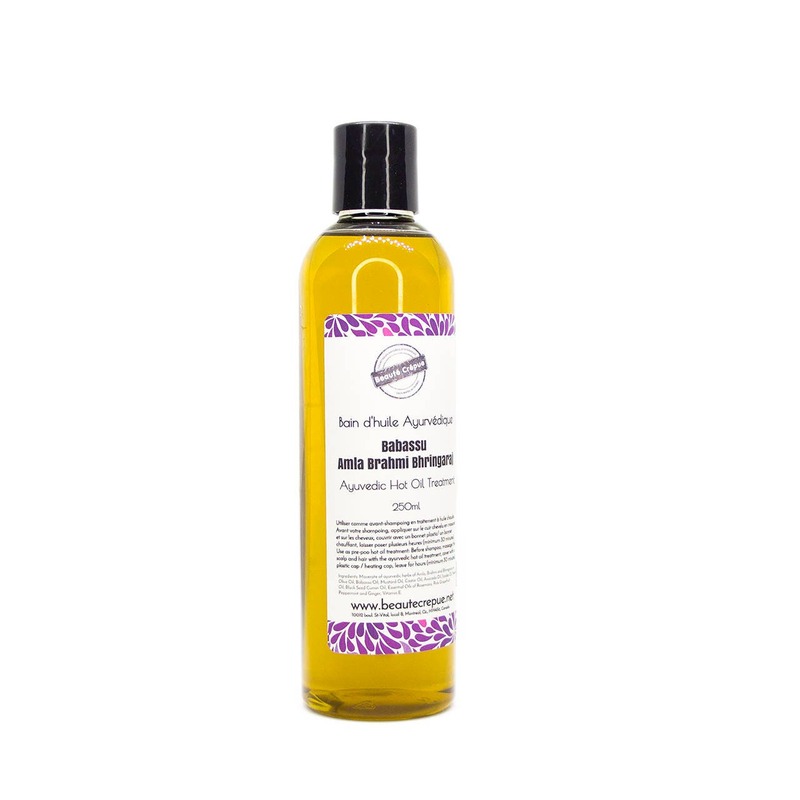 - Jojoba Oil: Restores vitality to dry, brittle hair. It enhances their brilliance and flexibility, beautifies. It eliminates loss. It nourishes hair. - Nigella Oil: It revitalizes, softens and tones the scalp and hair. It strengthens brittle hair. - Ginger Essential oil: very stimulating for the scalp. It activates the blood circulation in the scalp. - Tea Tree Essential Oil: purifies, cleanses and tones the scalp. Very powerful antibacterial, it effectively fights against dandruff. - Rosemary essential oil: It slows hair loss. It promotes hair growth. - Peppermint essential oil: very stimulating for the scalp. It activates the blood circulation in the scalp. - Vitamin E: Natural antioxidant. Ingredients: Olive Oil, Babassu Oil, Organic Mustard Oil, Avocado Oil, Castor Oil, Ayurvedic herbal extracts of Amla, Brahmi and Bhringaraj, Jojoba Oil, Black Seed Oil, Essential oils of Rosemary, tea tree, Ginger, pink Grapefruit and Peppermint, Vitamin E.